Baby: back to the sweet stuff! 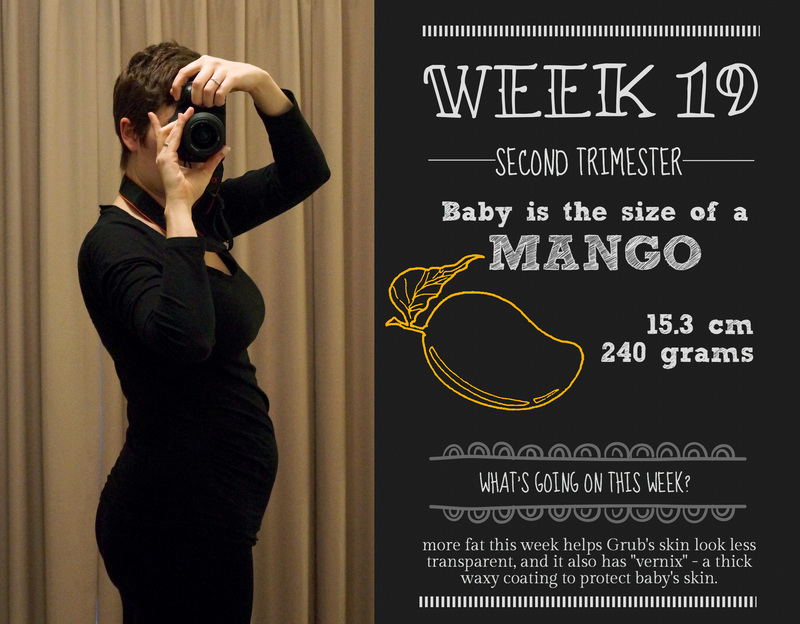 Grub is the size of a mango this week, which is making me dream of summer, and tropical fruit. A much nicer fantasy than those evoked my a sweet potato or an onion…bring on the warmer weather! What I’m cooking: A cheese baby – this week the vernix develops, which is a thick, waxy/cheese like coating to protect baby’s skin from the amniotic fluid. It should hopefully disappear by birth! Main symptom: Bloody nose – yes, still. Not really the full on nosebleeds, just constant snuffles, and tissues streaked with blood. Appetising, isn’t it? What’s on this week: Nothing! How lovely. The first week of the 2 week break, and I plan to loll about and not really get anything done. Heaven! Also, a short trip to visit Mum and her family (she lives interstate), which will be a lovely change of pace. I also have another massage booked on Friday, and I’m aiming to inspire Mr Nester to start getting the nursery organised – I want that cot put together! My photos are starting to take on more of an “S” shape now – I’m certainly not getting any skinnier, but I’m not looking much more pregnant either (at least not in my eyes). We’ve just come back from the trip to see Mum and a bunch of other family members, which was lovely. It’s amazing the comments you get, they’re never what I expect! The main question was whether I’ve been feeling sick (standard), followed by how much time I’m going to take off. Then there’s the “how far along are you? ?” questions, in which I seem to be pulling off some great con in making them think I’m 19 weeks. “Where?”; “You’re so tiny!”; “but there’s nothing there!” have been the common responses, which of course prompts me to lift my shirt and stick my stomach out. Very dignified. I also had my 94-year-old, very conservative, English grandmother give me a lecture on breastfeeding, and how important it was. This is a woman (whom I love very much) who can’t say “bottom” – she prefers “seat” instead. I was very surprised to hear the word “breast” pop out at such regular intervals! And yes, of course I plan to breastfeed, but I also mentioned to her about the difficulty some people have, and that I was certainly aiming to breastfeed for as long as possible (that said, I’ll be stopping before it gets weird. You know what I mean. Weird.). The pick of the bunch was the comment I mentioned in the last post, where someone basically told me I was definitely not just bump. Oh no, I was “spreading all around”. It’s very difficult to keep a sunny disposition to these well meaning comments, when on reflection I’m basically being told I just look fatter, not pregnant. Oh well. Hopefully that bump will be shoving its way out in the next few weeks, and then I can deal with the “you’re about to pop” comments for 15 weeks. I’m back off for another massage this week as well, which I’m looking forward to very much. I’ve been waking up with an aching right hip the last few nights, which is apparently very common at this stage, as your pelvis starts to bend and stretch to accommodate the extra weight. I’m hoping the masseuse will again release all the kinks I’ve worked up, which will give me a lovely ache-free week next week. Shopping-wise, the last post was all about the pram. I’ve also been researching a carrier quite manically, as I like the idea of an easier run to the shops, or walk with the dog, without having to lug the pram about. I was initially all but clicking “checkout” on the Ergobaby 360, until this week I found the Manduca. This carrier is very similar, however it’s German-made, contains a good proportion of organic/breathable materials, and is quite a bit cheaper (the Ergo 360 is about AUD $240 with the newborn insert, and the Manduca AUD $170). It also has the added benefit of having a newborn support built in, whereas the Ergos need an additional insert, at an additional cost. The other prohibitive factor with the Ergobaby range is that the reviews have said they don’t breathe well, especially with the newborn insert, and since Grub is due at the start of summer, I don’t fancy increasing the heat load at that time. I took myself off to the local baby store today to check both out, and they’re very nearly identical. They feel very similar around the hips (although the Manduca has two adjustment straps – one on each side – instead of the Ergo’s 1), similar shoulder straps (although again the Manduca can be adjusted to a crossover strap set up, which to me felt firmer), and similar quality (high). Whether it was knowing the added plusses of the Manduca or not, I was quite taken with it. I think that will be my next purchase. What else is on this week? I’m planning to recover the cushions of our glider chair I bought months ago (a steal on eBay), so I’ll be posting hopefully in the next few days with the results of that effort, successful or otherwise! I own a sewing machine, and have used it for a few things, but I’m by no means an expert. Eh, what’s the worst that could happen? (Expect a post from the hospital after sewing my fingers together, or similar…).